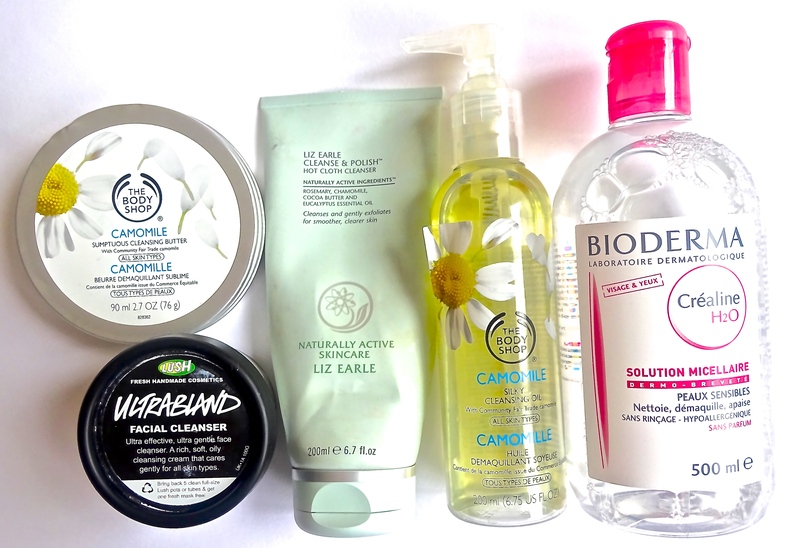 I have tried many cleansers over the years, most of them recommended by Caroline Hirons or Lisa Eldridge because of course anything good enough for them is good enough for me! Here are the ones that have made the final cut and that I repurchase time and time again. My good old Bioderma never lets me down. It’s a micellar water, one of the originals before the mass market caught on to this type of product. Most skincare brands do micellar waters now but I will always stay faithful to my Bioderma, especially now that it’s easier to get your hands on here in the UK – gone are the days when I used to fill up half of my suitcase with these on the way back from France! Gentle yet effective, it removes all of my makeup with a simple wipe of a cotton pad. Literally. Mascara and all! Best of all it does not irritate my skin or eyes in the slightest. I will always have one of these bottles handy. In fact I tend to have a few because I could not face living without it. No exaggeration! Apparently this is what many makeup artists use on shoots for quick makeup changes as it’s so gentle. 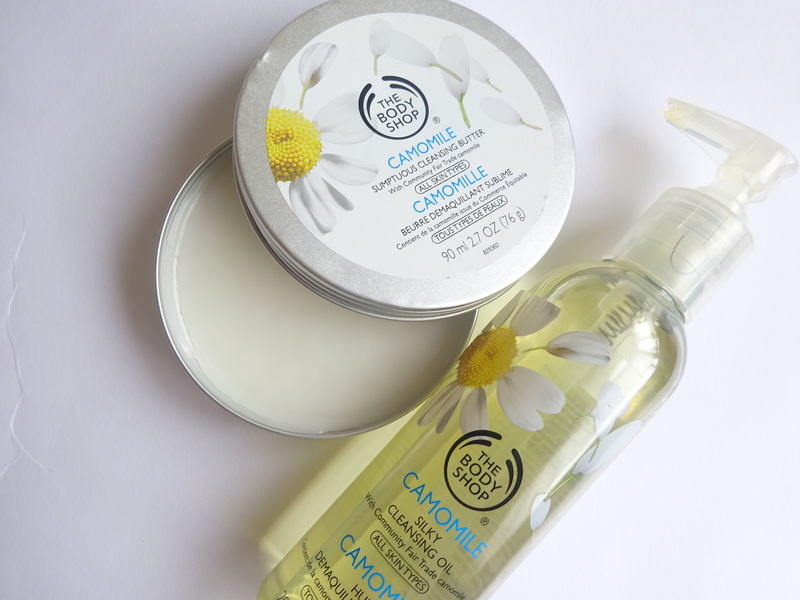 The Chamomile cleansing range from The Body Shop is a winner for me as it’s so soothing on my skin. I massage the oil or the balm in to my skin to break down all of the makeup and then wipe it away with a warm wet flannel and TADAH! my face feels clean and fresh. I sometimes remove my mascara with Bioderma beforehand to avoid the black panda face these type of products give you. Although it’s quite satisfying to wipe away all of the black makeup smeared across your face. 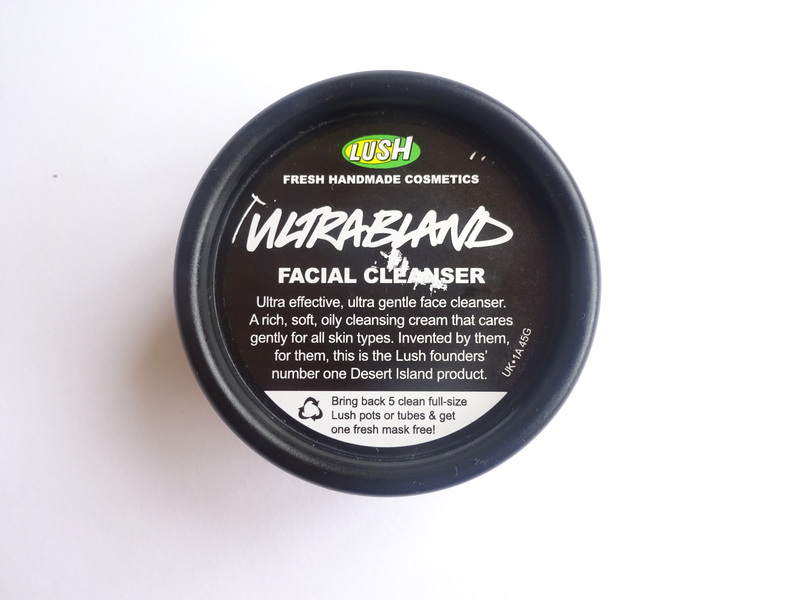 Ultrabland from Lush was recommended to me by the makeup artist Fyza. I previously hadn’t tried any Lush skincare and this started a bit of a love affair with their products. If Fyza says that it can tackle her makeup-heavy looks than who am I to argue? This is similar to the Chamomile balm but seems to be a little more heavy duty. Perfect for those days when I’ve really piled on the makeup. Lush tends to avoid all of the ‘nasties’, so I also feel a bit better knowing that I’m not massaging a load of chemicals into my skin. As you can see, this tube is very well loved. Liz Earle’s Cleanse and Polish Hot Cloth Cleanser is one of those products that everyone should have in their collection. It’s a fuss free cleanser that does what it says on the bottle. Again, like the other cleansers, it’s very gentle but does the job well. The scent is soothing and it leaves your skin feeling fresh. I’m pretty sure that everyone knows somebody who uses this religiously. It’s been around for a long time and serves generations of family’s happily cleansed faces. I often use this after one of my other cleansers as a second cleanse. Just to make sure my skin is squeaky clean and rid of all makeup. What cleansers do you swear by to get your skin squeaky clean?